Gaura Purnima Festival: Sun, March 12, 2017 ~ The Toronto Hare Krishna Temple! One of the Toronto Hare Krishna Temple’s biggest festivals of the year, Gaura Purnima, falls on Sunday, March 12, 2017. Celebrations will start early in the morning and continue into the evening where expect a huge turnout of devotees! 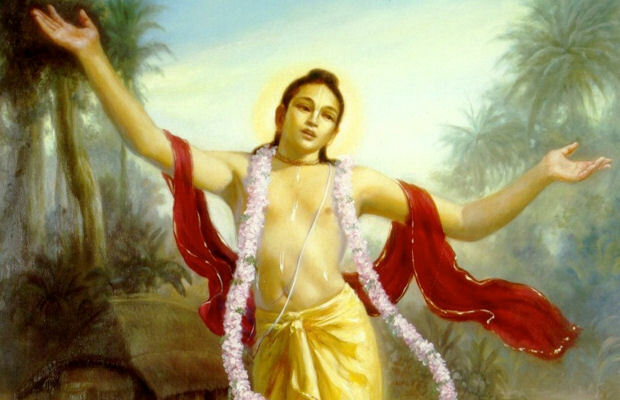 Gaura Purnima marks the divine appearance of Lord Chaitanya Mahaprabhu, who is non-different than Lord Krishna. He appeared in Navadwipa (modern day West Bengal) in 1486. Lord Chaitanya was born on full moon and blessed everyone with the moonlike rays of his teachings. He launched the movement of chanting the Holy Names of Krishna and taught how we can gain enlightenment in this age by chanting the Hare Krishna maha-mantra. It will be a special day of celebrations and for more details about this sweet festival, including a schedule of events, keep an eye on our website. There are also many sponsorship opportunities still available for the festival: garlands, flowers, aratis and the festival feast. * Please Note: Daylight Savings Time kicks in the middle of the night between Saturday and Sunday. However, the Deity Department shifts our clocks after the morning program. So, the Mangala Arati will take place at 5:30am (4:30am if the time change never happened). For sponsorship opportunities, feel free to contact us.